Pirate birthday party ideas are often hard to come up with. Especially when you have to think about the invitations, cake, locations and more. 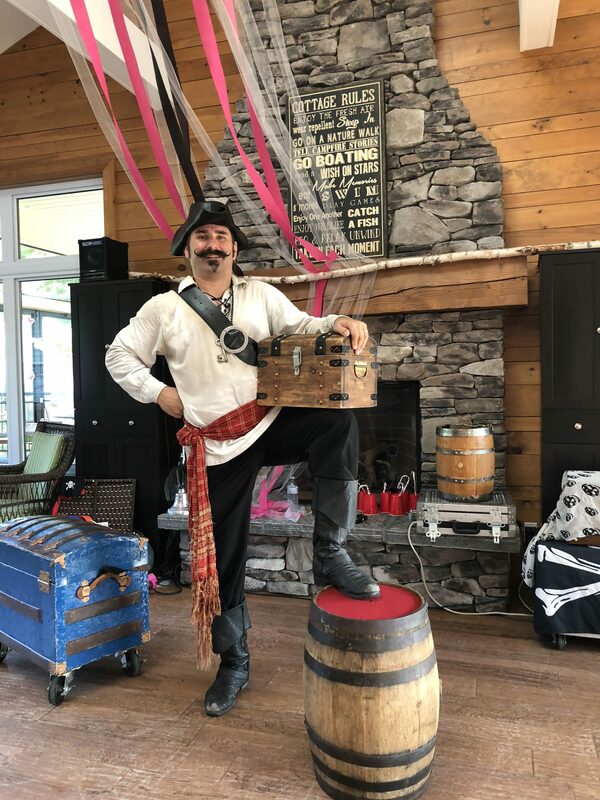 Captain Corbin the magical pirate can make your birthday party a whole lot easier. With the magical Captain Birthdays are a blast! A pirate and princess themed birthday can be a lot of fun. It often seems like a lot of work. However, With a little preparation your pirate party can look great as well. Make your child’s birthday one to remember for a long time. 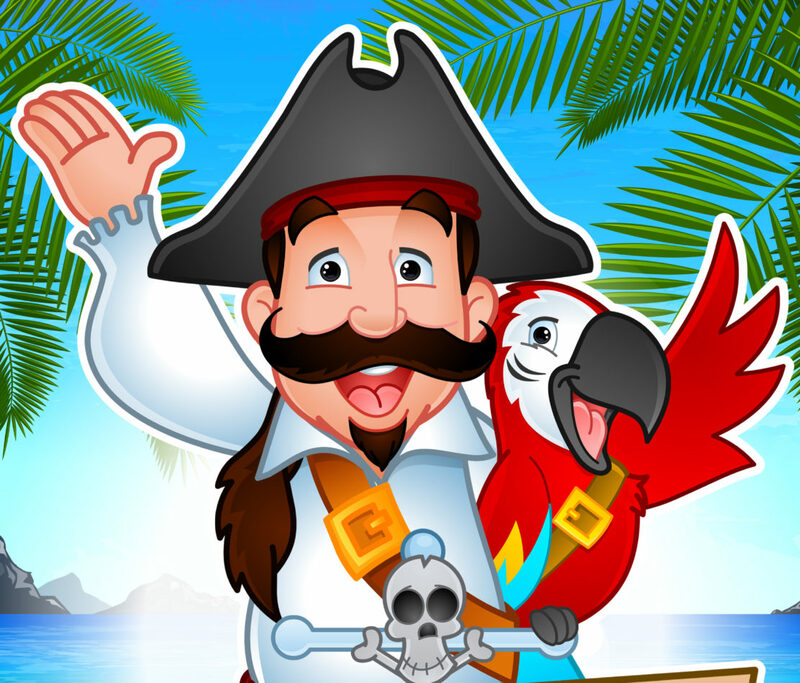 There be lots of pirate themed games you can find online. Great fun for a pirate party. some of my favorites involve walking the plank! Just put a large 6 foot long and very wide plank on the floor on top of some bricks. Get the children to walk across it balancing an egg on a spoon. Another favourite game is of course a treasure hunt! Make up treasure maps of your location. Your house backyard or interior with a dotted line they must follow to find the treasure. To avoid the kids that jump ahead you can have the dotted line lead to another map that leads to another map that leads to the treasure. Or have no dotted line at all on the map and on the back side add a list of clues that they must follow. I perform Pirate themed birthdays and all kinds of other types of magic shows. Sometimes I’m on a big stage at a theatre or festival and sometimes I’m performing magic on my barrel in the park. Every show I perform is family friendly and a lot of fun. I have been on stage at The Grand Theater in London Ontario and I’ve performed in Windsor Ontario at the Devonshire Mall. I have truly enjoyed every performance. Some of my favourite shows however, have been at private birthday parties. I have a blast performing pirate themed birthdays. 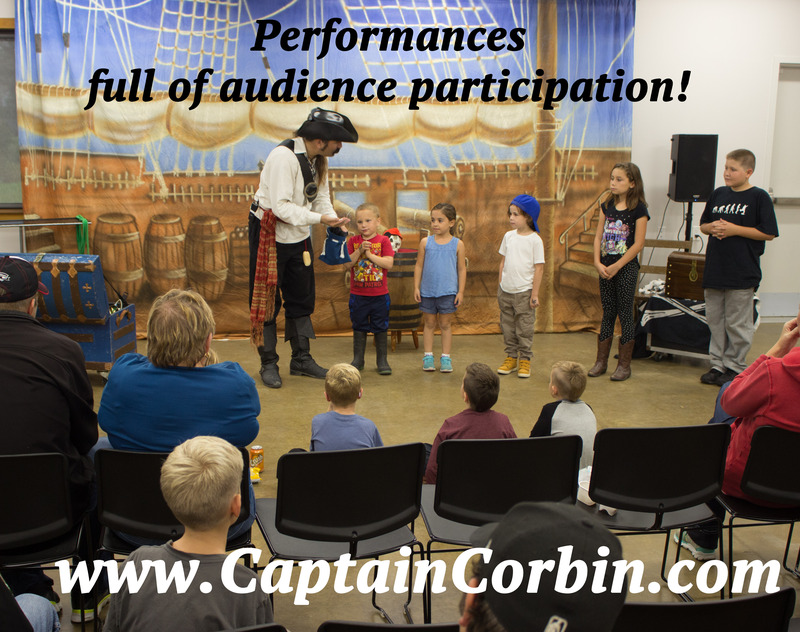 As Captain Corbin my pirate themed magic shows are engaging, entertaining and fun! A Pirate themed birthday party is a very special event. A child’s birthday is remembered for a long time filled with picture perfect moments. During my show I fill the performance with memorable situations and photo opportunities. Each birthday is customized to be perfect and it all begins with the pre show communications. Once the time and date of the event has been scheduled the customization begins. The show is pirate themed, however inside the show many more personalized effects are included. Some of the questions I ask include; what is the birthday boy’s favourite television shows, Games, Sports, hobbies, etc. What are your birthday party ideas and how can they be incorporated into the show. I ask about the child’s likes and dislikes and any other information that is important. After all those questions and more, I go to work designing the perfect pirate themed birthday magic show. Booking early is highly recommended for this very purpose! I love the challenge of last minute bookings, but the longer I have to work on the show the more personal it becomes. On the day of the show I arrive in full costume very early. As Captain Corbin the magical pirate I don’t want the children to see me as anything other then the pirate. With pirate music playing out of a small speaker attached to my pirate sash I knock on the front door and announce my presence. After meeting the most important birthday child, I set up in the predetermined area and with my pirate music playing in the background I wait until all the guests have arrived to begin my pirate themed birthday. The show lasts about 45min. and is full of family friendly fun and engaging magic. Every show is customized, no two shows are alike. Each is designed to be age appropriate for the birthday child and include his likes. Contact me for more details! 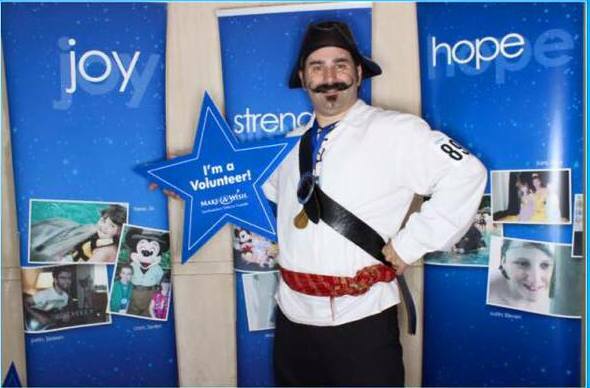 I often perform with the make a wish organization as Captain Corbin the magic pirate. Make a wish with a magic pirate is a great match. The Make a wish foundation is an incredible organization that grants the wishes of children with life-threatening medical conditions to enrich the human experience with hope, strength and joy. The foundation is national and international with branches all over North America. The international foundation is the largest wish-granting organization in the world, making wishes come true for more than 450,000 children since 1980. Every year this wonderful organization holds many events to raise awareness and funds. I always try to be a part of as many events that I can. Some of my favourite events include the rappelling event. Every year they have people raise funds and rappel off of London’s tallest building. During the winter season in Port Stanley Ontario one family holds their own fundraiser inviting people to come to their home and look at the Christmas light display. The Port Stanley Christmas light display is incredible with thousands of lights and hundreds of decorations. Every year they raise a lot of money for the Make a wish group. You can help out at these events yourself. contact them today. 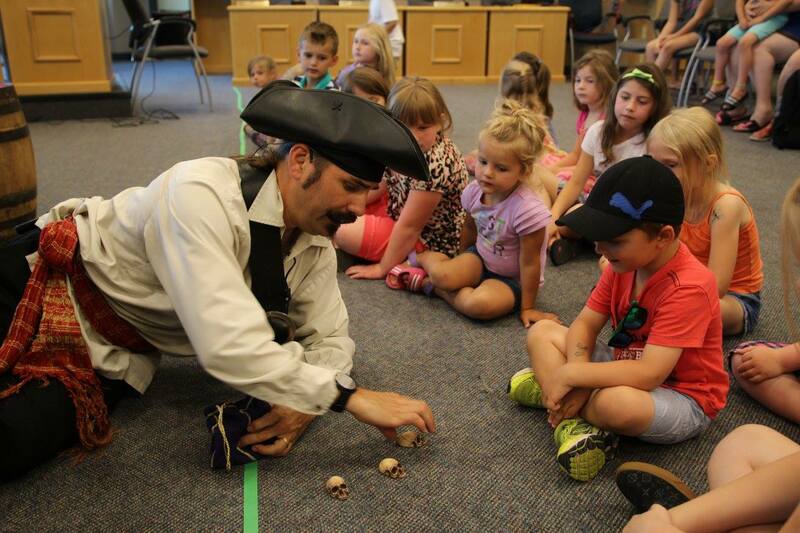 The children really “light up” when they see a pirate marching around. I perform family friendly magic that gets the children really excited. The Make a wish Foundation is the only group I currently volunteer for. All my free time goes to them. If you have an event you would like to hire me for, or would like more information, please contact me today! This weekend I’ve been “sailing” all over North America with my tropical pirate themed Christmas magic show. What does a pirate do in the winter? Well, Santa may rest in the summer, but a pirate never rests. I’ve been performing my Christmas pirate shows all over the place. 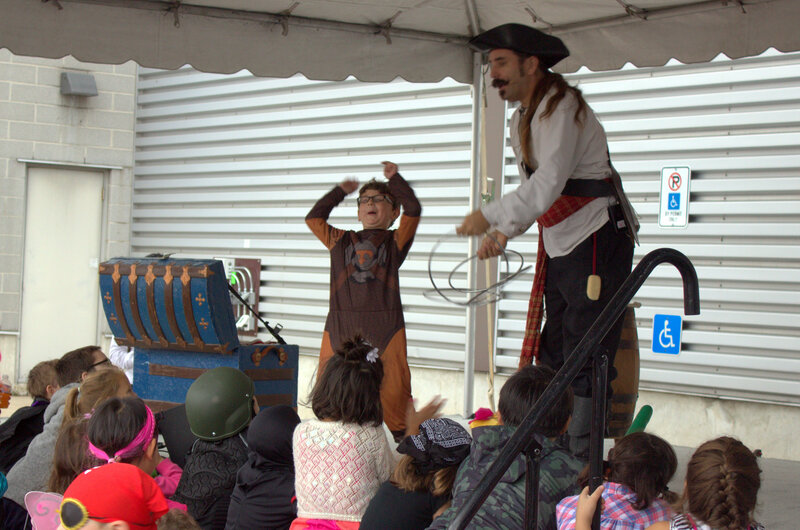 Magic shows with a pirate theme are a lot of fun at Christmas parties and special events. Why have a normal magician when you can liven up your employee holiday party with a bit of pirate magic fun? My holiday corporate pirate magic shows are full of interactive pirate magic and Christmas themed magic. My pirate magic sword turns into a candy cane, my first mate becomes a frozen snowman and at the end of the show instead of a magic Christmas tree, Captain Corbin puts out his Christmas barrel which magically fills with all his Christmas wishes, a long red and green garland of jewels, lots of root beer and of course gold, which he immediately throws out to the audience. This past weekend I performed for childcan Canada in London Ontario. The show for Childcan went very well. It was the first time they had a large magic show at their holiday party. I had performed for them at the Highland golf club in London Ontario last year as well, but at the time I only performed my strolling or table hopping magic entertaining the children. They loved it so much they had me back for the full magic show this past weekend. I must admit I think I surprised them with how awesome the show went. Upon arrival the first thing I always do is set up my music. At a Christmas party instead of pirate music for pre show warm up, I play some of the most popular Christmas classics to get everyone in the mood. This was the first surprise for the client. The music always adds a lot to an event and it’s often the last thing people think about. During my show the music switches to an instrumental nautical themed background noise and the performance begins. I remember the organizers ushering the children to me for the show, then wandering off. A few minutes after I began the show however, everything seemed to stop and all the adults began gathering around my audience to watch. That was another surprises as they did not expect my show would be interesting to them, but of course it always is. A professional magic show that is family friendly and interesting to all ages. At the end of the performance I received many positive comments and was immediately booked for next year. If you’ve never had a pirate magician at your holiday parties I would highly recommend it! Tons of fun, Ahoy!